Cyprus has a Mediterranean climate along the coast, with mild and rainy winters and hot and sunny summers, while in the inland plain of Nicosia the climate is hotter in summer; in the mountainous areas, the climate is obviously colder. Along the coast, the climate is typically Mediterranean, with an average daily temperature in January around 11/12 degrees Celsius (52/54 °F). Rainfall is not abundant, about 350/400 millimeters (14/16 inches) per year in cities like Larnaca and Limassol, and most of the rainfall occurs from November to March, with a peak in December and January. In winter, periods of bad weather, sometimes even a bit cold, alternate with periods of good weather, when the sun shines. Summer along the coast is long, since it runs from late May to early October, and it's hot and sunny, a little muggy but also tempered by steady breezes. In general, along the coasts it never rains for a long period, from June to September, during which the sun always shines. Here are the average temperatures of Larnaca. As mentioned, the rains on the coast follow the Mediterranean pattern, and are not abundant, although occasionally they can be heavy in winter. Here is the average precipitation in Larnaca. The sea in Cyprus is warm enough for swimming from June to October. In winter, it is a bit cold, though it doesn't drop below 17 °C (63 °F). In the Mesaoria Plain, winter is still mild, but it's slightly colder: the average temperature in January is about 10 °C (50 °F), and at night the temperature can drop around the freezing point. Summer is very hot, so much so that in the capital, Nicosia, highs are about 37 °C (99 °F) in July and August. This inland area makes Cyprus the hottest island of the Mediterranean, though this only applies to this area: the climate of the coast is similar to that of other Mediterranean islands. The highest temperatures are recorded during heat waves coming from Africa: in Nicosia the temperature may reach or exceed 40 °C (104 °F) from May to October. The rainfall pattern is similar to that of the coast: in Nicosia, average annual precipitation is about 360 mm (14 in), of which 70 mm (2.8 in) fall per month in December and January, while it never rains in summer, during which the sky is almost always clear as on the coast. The reason why in Nicosia the summer is so hot, relies in the fact that the plain where it is located is locked between two chains of mountains, which hinder the sea breezes: in the north lies the chain of Kyrenia (or Girne), while in the south, namely in the central part of the island, lie the Troodos Mountains, culminating in Mount Olympus, 1,952 meters (6,404 feet) high. Here there is also a ski lift for winter sports. The two mountain ranges have a greener landscape and are covered by forests. Here are the average temperatures of Prodromos, situated at the foot of Mount Olympus, at 1,300 meters (4,250 feet) of altitude. Here precipitation amounts to 800 mm (31.5 in) per year, and in winter, when it can also snow and freeze, it is abundant. In summer, rare thundershowers are possible. Here is the average precipitation. In Nicosia, and generally in Cyprus, the sky is almost always clear in the long summer, but even in winter the sun shines for a good number of hours. 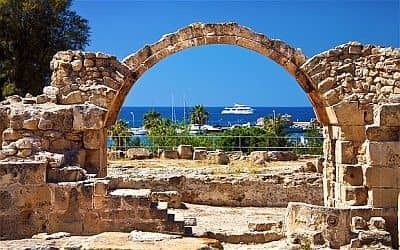 If you want to visit the cities of Cyprus, the Greco-Roman ruins as well as the Byzantine monasteries, the best periods are spring and autumn, and in particular from mid-April to mid-May, and from mid-October to mid-November, when you can find daytime temperatures around 20/25 °C (68/77 °F), with cool nights, sometimes a bit cold in the plain of Nicosia; sometimes, however, it could rain. Spring is more advisable because it has longer days, and also because in this period nature is in bloom. In these two seasons, you can avoid the summer heat, and this applies especially for the plain of Nicosia, where the heat is often intense. For a beach holiday, you can go from mid-May to mid-October, even though as previously mentioned in May the sea is still cool. It is possible to combine some moments of relaxation at the beach with excursions, for example in June and September, remembering that it can get hot, especially away from the coast. In winter: bring spring/autumn clothes, a sweater, a jacket, a raincoat or umbrella; for the mountains, warm clothes, such as a down jacket, a hat. In summer: bring light clothing, sunscreen, a sun hat, a light sweatshirt for the evening, a scarf for the breeze; for the mountains, a sweatshirt or sweater, a light jacket, hiking shoes.